Simply... motivated to get to know us. As a welcome gift, we have prepared a €100 Käth & Nanei "Get-to-now-us voucher" for you. This voucher can be redeemed for a minimum stay of 2 nights. To redeem your voucher, please enter the voucher code when submitting your enquiry or booking. The amount will then be deducted from the final total. 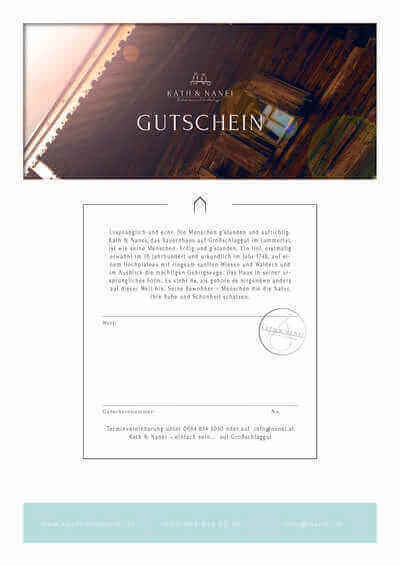 Only 1 voucher* can be redeemed per booking and only for your first stay at Käth & Nanei. For a birthday, wedding, passing an exam, an anniversary, or an annual trip together. Give someone special days at Käth & Nanei. Request a voucher via the enquiry form or by email to info(at)nanei(dot)at. It will be sent to your inbox as a PDF or in an envelope to your address by post. The voucher can be redeemed after the payment has been received at the account below. *No cash alternative is available.